Most well-functioning campus workplaces at the University of Kentucky have one thing in common: student workers. For photographer Dana Rogers, employee of the College of Arts & Sciences, being a good student worker means appreciating her coworkers, being open-minded, and staying organized. She has recently won the title of UK’s Student Employee of the Year. This award is given to a student on campus who shows determination both in the classroom and the workplace. Her supervisor, Brian Connors Manke, knows that she is a top-notch worker. “She is the most enthusiastic person I’ve ever met about her passion – photography. She is so driven by it and it shows in her dedication to improving her skills,” he said. Dana works in the College of Arts & Sciences but works more intimately in a department called the Hive. There, in a place catered to the creative and technical needs of the College, she lets her personality thrive in her work and takes inspiration from those around her. “Dana is responsible for photography of all sorts,” Brian said. “Portraits, events, scenic, abstract, etc. that help visually share the stories of the College of Arts & Sciences and UK.” According to him, she has almost eliminated the use of freelance workers for the college’s professional photography needs. She is thus invaluable to Hive and the College. Though she is very successful now, there was a time when she thought her dream job was too far out of reach. “I had always dreamed of being a photographer, a dream created under the influence of my aunt,” Dana said. “But my family never had much money growing up; it was hard for me to fathom a career in which you had to pay a lot in order to make money.” Her work with photography in her job at UK has made her dream become a more concrete reality. Dana graduated this spring with a degree in Integrated Strategic Communications, and will go on to a prestigious workshop in New York specializing in a style of photography called wet plate collodion, a technique she has wanted to learn since high school. 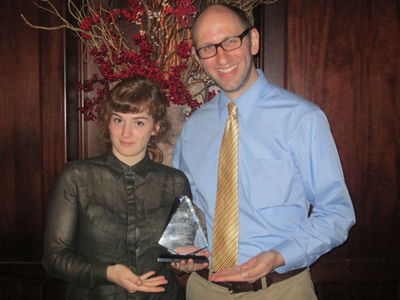 Photo: UK's Student Employee of the Year, Dana Rogers, and her nominating supervisor Brian Connors Manke.